Sports have come a long way since the first Olympic Games, when the events were mostly running, discus tossing, and wrestling. Throughout history, athletes have invented plenty of tests for the human body’s strength, coordination, and endurance, and widespread sports like soccer, surfing, and snowboarding help connect the world together. But a few sports are so unusual — like wife-carrying, a real sport in Finland — that they only happen in select places, so you’ll need to travel there to see it happen in real time. Here are the seven most unusual sports around the world worth traveling to see. 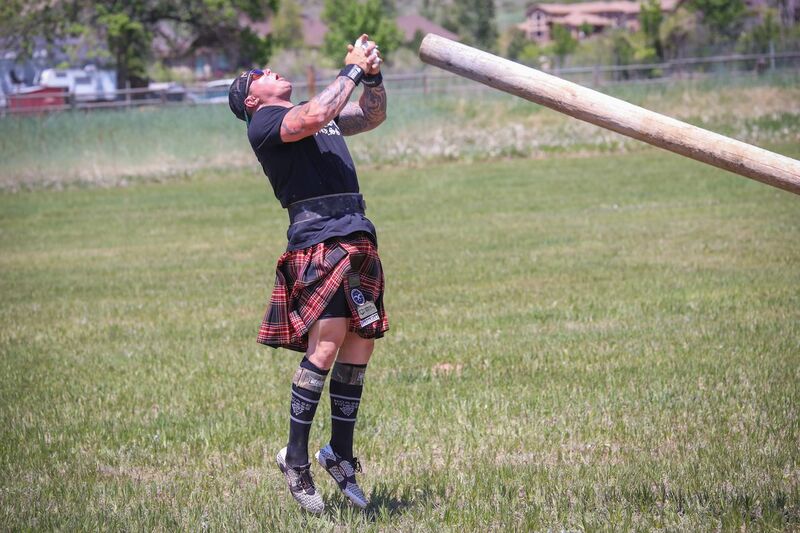 In Scotland, the caber toss is a traditional athletic event in which contestants toss “cabers” — trees that have been felled and trimmed so that one end is slightly wider than the other. Contestants cup the smaller end in their hands, then throw the caber so that the large end hits the ground first. Rather than distance, the aim is to get the caber to land in a 12 o’clock position in relation to the thrower. The sport is said to have grown from when lumberjacks needed to form bridges for rivers or streams during wartime, and tossed logs to get across. Nowadays, Scotland has plenty of bridges, and caber tossing is a focal event at the Scottish Highland Games, where kilts are mandatory for all competitors. Native to Southeast Asia, sepak takraw’s name comes from the Malay word “sepak,” meaning “to kick,” and “takraw,” the Thai word for a woven ball. But while its name literally translates to “kickball,” players are actually allowed to use their feet, knees, chest, and head to kick a woven rattan ball over a volleyball-length net. As a result, all six players often leap into the air and kick the ball over with impressive karate-style moves. To see this for yourself, you’ll have to travel to Southeast Asia, but this might not be the case for long. There’s a strong movement in the countries where sepak takraw is played in to have the sport included at the 2022 Olympics. While some husbands complain about getting their wives off their backs, the sport of “eukonkanto” or “wife-carrying” involves male competitors racing one another with female contestants literally on their backs. Originating in Finland, where the Wife Carrying World Championships are still held every year, the sport is inspired by tales of 19th-century bandit “Ronkainen the Robber” whose men supposedly raided Finnish villages and ran away into the forests with the villagers’ wives on their backs. Admittedly, this is only one theory. Another is that Ronkainen has his thieves train by carrying heavy sacks on their backs. Whether from here or from the wife-stealing, the sport evolved and now, international rules state that each pair must get around a 253.5-metre track with two dry obstacles and one water obstacle as fast as possible. The winning pair, in most competitions, is rewarded with a cash prize and the woman’s weight in beer. The French Federation of Pelote Basque describes pelote basque as a sport that has maintained all its authenticity and “Basque spirit.” Traditional outdoor courts can be found throughout the region and players still wear the classic uniform of white pants with a solid color shirt. However, it’s not just its strong Basque heritage that makes pelote basque unusual, but the speed and equipment with which the game is played. Players in two teams stick their hands into the base of long, woven, arched baskets. They use these baskets to catch balls and to throw them, hard, against a wall. They score by hitting the ball so that it lands and bounces either out of the opposing team’s reach, or outside of the court. That small, hard ball is moving extremely fast — and in some places players wear helmets to protect themselves. Throwing a metal puck at a gunpowder target might not sound like a great idea, but in Colombia, tejo is the country’s most popular sport — second to soccer. Often played by Colombians with a beer after a long day at work, the game involves players throwing a “tejo,” or metal puck, down a roughly 18.5-meter long alley to a clay-covered board. The aim is to hit the board’s metal rings, known as “bocin,” some of which contain little white triangular paper packets called “mechas.” These are filled with gunpowder and explode upon impact, earning the player who threw it extra points. If you’ve ever wished tag was a competitive sport, the Indian sport of kabbadi is for you. Involving two teams of seven players, the aim is for each team to tackle or tag out as many of the other team as possible. This is done by sending a “raider” into the opposing team’s side of the court to tag as many opponents as possible. To make things even harder, the raider also has to hold their breath while in the opposition’s half of the court. In order to prove that they are doing so, they must chant the word “kabbadi” over and over until they return to their half of the court — if they manage to do so without being tackled, that is. Extreme sitting might not sound like the most exciting sport in the world, but the German sport of sporthocking takes sitting to a new level, combining the skill of skateboarding and parkour with sitting down. “Hocker” is the German word for stool and sporthocking involves using a stool to perform a variety of tricks, some of which can take years to learn. The end of a routine is marked by the sporthocker sitting down on their stool, making it perhaps the only sport in the world where sitting down is actively encouraged — and with all those tricks, sporthockers probably need a break.